I’m not a football fan but I support my country at International Level, I’m more of a rugby girl it has to be said. Yes it requires a lot of natural talent to be a World Class footballer but I always find rugby more impressive. One thing that strikes me is the attitude of rugby players opposed to that of football players. Rugby players get many bad knocks during a game and get on with it, whereas there’s a lot of drama in football with players diving and claiming to be injured when you can clearly through the mechanism of “injury” that they are perfectly fine. Late last night I heard the awful news about England footballer David Beckham. For the last 10 or so years he has been a heart-throb for girls my age although I’ve never jumped on that band wagon I can see why, it’s not just his physical appearance but his sheer talent in the sport and also he has done a good deal of charity work. Even as recently as Friday night, I heard James Corden on Jonathan Ross say what a wonderful and genuine person Beckham is. Whilst playing for Milan on Sunday night, Beckham tore his Achilles Tendon. A sprained Achilles is bad enough but to tear or rupture it can leave you in insufferable pain. 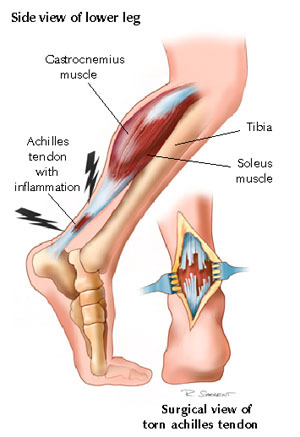 The Achilles is the strongest tendon in the body. It is an area that commonly gets injured in football and also gymnastics mainly due to pivoting and because it has to withstand great force. It also plays a vital role in running, providing elastic energy to help us bound along. The tendon is a like thick white cord, which emerges from the Soleus and Gastrocnemius muscles in the calf and inserts into the heel bone. If you can bear it, you can see a picture of a surgeon holding an Achilles Tendon whilst operating on it. Please only look if you are not squeamish. A general tear will keep you out of action for a minimum 3 months, depending on the severity Beckham is likely to be out for 5 – 6 months, he will be extremely lucky to make it to the World Cup as part of the England squad. His chances of recovery depend on numerous factors, mainly how big of a tear it has. If Beckham returned to football too quickly after surgery he is very much at risk of re-rupturing the tendon. His age is also a massive factor, he’s 34 which is the peak age for footballers to sustain injury. Beckham has flown to Finland today and arrived safely to meet with a surgeon to decide on a treatment plan. A key factor in the repair is getting to it on time as the longer they wait, the shorter the fibers will go and they need the Achilles to be the correct length if he wants to have a chance of playing football again near enough to the level he is at now. Even if he was to lucky enough to be somewhat ready for the World Cup in three months time, it takes 6 – 8 games to get back to being match fit and also may have psychological issues to deal with. This is the second time that Beckham has sustained an Achilles Tear, in 2006 he tore his right tendon so it’s possible that this will also be factored in as with any injury if one side is injured, the other side takes the additional load and strain during recovery. We’ll have to wait and see what the surgeon says his prospects of recovery are when a statement is released later today but I’d imagine Beckham has a long road ahead of him no matter what the severity of his injury is. Such a pity for a very talented man who was set to make his record fourth appearance representing his country in the 2010 World Cup. You can click here to read an extensive post from the BBC. This morning an update was posted on his website thanking his fans for their support. Poor Becks!